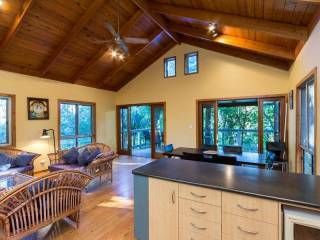 Three bedroom lowset house surrounded by bush and native wildlife. 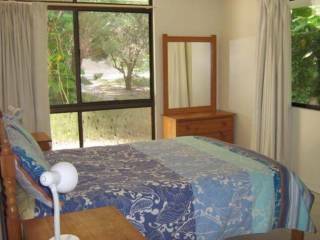 Refurbished with three bedrooms and can sleep 6 in style. Contemporary kitchen including dishwasher, polished concrete floors, new carpets in bedrooms, insulated and a to die for double daybed on the private north east side. Walk to beach. Relax and enjoy the native birds and the soothing sounds of the ocean. Quality furniture and appliances throughout. You won't want to leave. 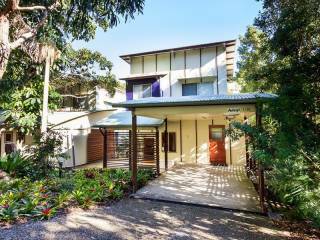 Backing onto bush land you are only a couple of hundred metres to fabulous Home Beach and minutes to the Straddie Pub and Cylinder Beach.